This referendum business continues to pay out… The writing seems to be on the wall that “No” will win the day (as far as the market is concerned, I’m not quite so convinced (see earlier posts)), nevertheless, more reassurances from the latest poll released at 11:45 UK time today pushed the value of the pound a bit higher. The quick fingered could have picked up some free money here. Apologies that I have been unable to record my screen lately. 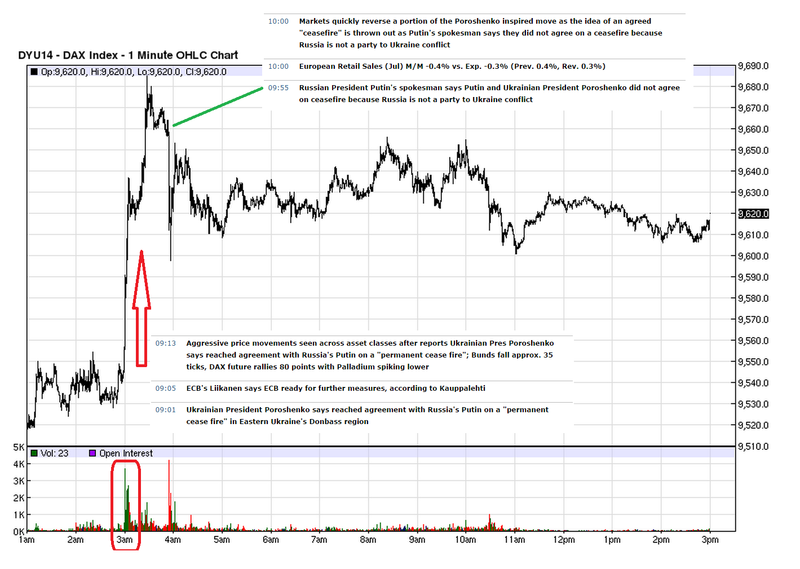 Still, as with the Poroshenko comments yesterday, the 1 minute chart tells the story well enough. 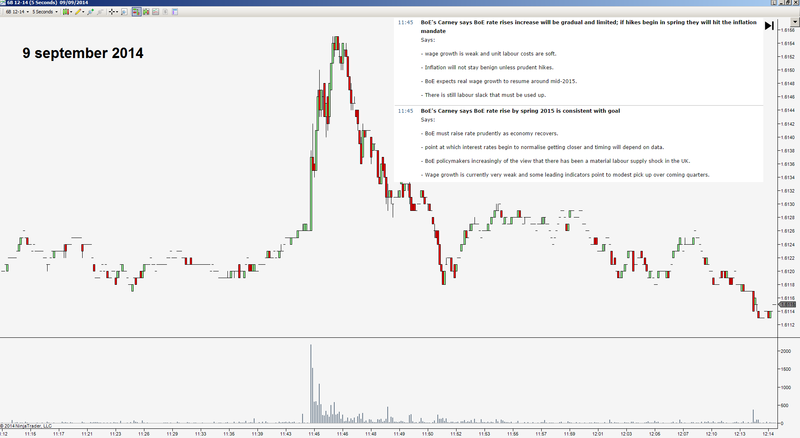 While it is always possible to screw up just about any news-play trade, this one is as close to “free money” as you are likely to see. Extra points if you were able to short on the back of the Russian denial an hour later! 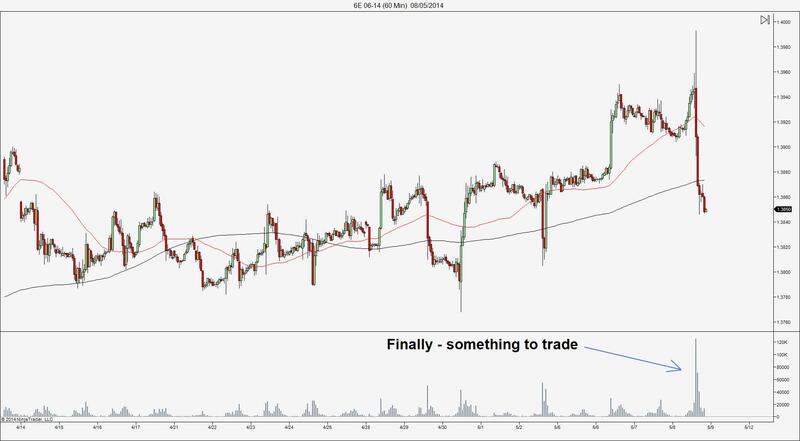 8 May 2014 ~ Best Trade Of 2014 So Far? Today Draghi gave a strong hint that the ECB will unleash something at the June meeting. While several major banks have apparently been anticipating some monetary stimulus from the ECB, the way Draghi practically spelled it out for us today prompted the Euro to drop severely. Something I am quite struck by is the general lack of GOOD reason to place a trade, on the Euro, or any other major Futures product. Take a look at this chart for instance. 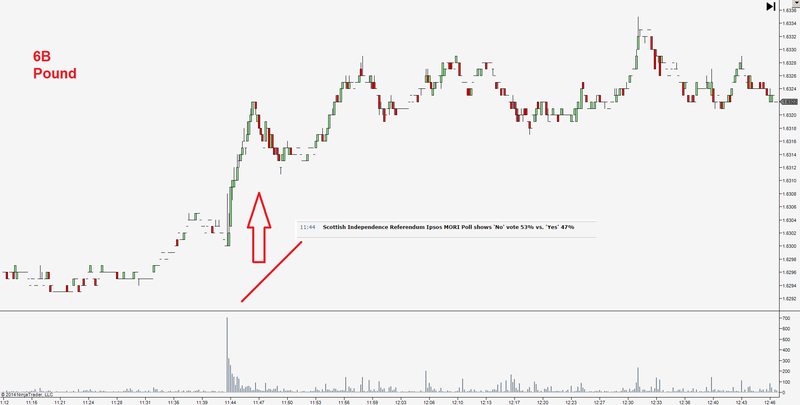 Volume is nothing to write home about, day after day, until at last Draghi breaks the deadlock. I think this underlines how important it is to keep your powder dry for the really good opportunities instead of getting your hands dirty in the constant chop. Garbage, Garbage, Garbage… and then finally some action.